Week 10---Julia warned us that this segment of the journey would include “waves of resistance and hope” in “a birthing process”. 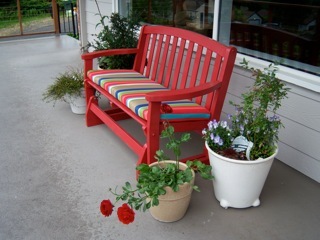 Every day as I turn the corner of my porch and see my red bench and red door I experience a wave of hope! They are my daily inspiration reminding me that my mind is constantly CREATING and sometimes I catch those thoughts and MAKE THEM SO. The door was open (literally) to an avalanche of self-criticism and carrying my 300 lb. critic across the deck meant I arrived home discouraged & tired. Creativity always involves risk---what if I choose the wrong red? 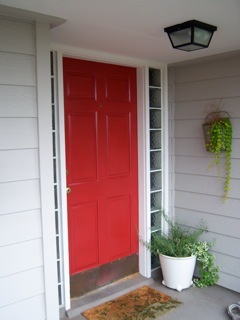 My helper (husband) after the 3rd coat of primer and paint assured me that it absolutely was the RIGHT RED. I failed (picture me hands raised with a smile on my face) to buy the right amount of paint. Michelangelo must have faced this very difficulty! Some people might not see the connection; but my imperfectly accomplished creative movement to paint a door and bench somehow helped me to make a phone call and write a letter that are the first baby steps for two other stalled out projects. Maybe I can take one more baby step today!